With new Lebanese and Mexican additions, Geoffrey's is set to excite foodies all over again. 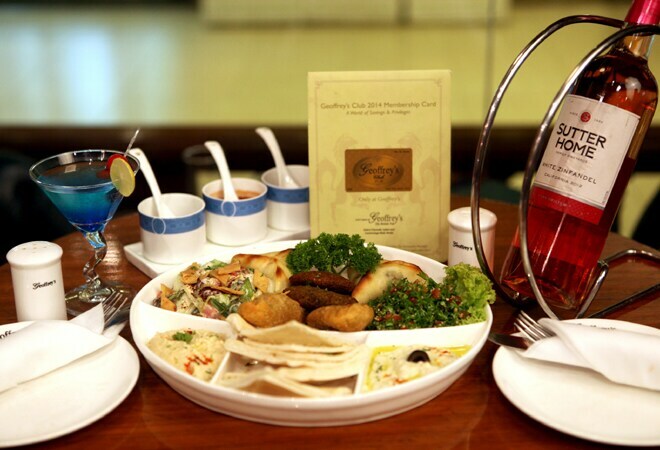 The flavours of the Veg Mezze platter were at par with any meat option you might have considered. I've been eating at Geoffrey's for many years now. I have many fond memories of the place and have always had a wonderful time there. Though I have to admit, over the years my visits to the restaurant have drastically reduced. Not for any fault of the restaurant but simply because there are many newer options around! Perhaps this was the exact thought in the minds of the team at Geoffrey's when they decided to introduce Mexican and Lebanese food as part of its menu. Risky, yes. Effective, yes too! My meal began with the Lebanese platter, that's obviously non-vegetarian and the Veg Mezze platter. And both were equally good. I especially enjoyed the Veg Mezze one; the flavours were at par with any meat option you might have considered. Next in line were the Chicken Burritos and Shish Taouk. Those who have been fans of burritos and have tried the dish at every possible opportunity might be left a little underwhelmed with this one - it isn't bad; it is just not great! The Shish Taouk however is fantastic! Grilled just right, you won't be able to stop yourself from falling in love with it. There was also a Pollo ala Crema pasta which wasn't bad either - just that I was too busy savouring the dishes before to care much for it in any way! I honestly had no great expectations from desserts here. Death by Chocolate isn't a unique concept after all. But if unique is what you're looking for, give the Sizzling Brownie a shot. 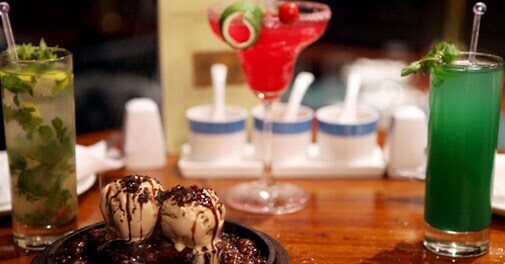 It's a brownie served as a sizzler, yes! The chocolate is cold, the brownie is 'sizzling hot' and the taste is marvelous. Whoever came up with this idea is a sure shot genius! Did the new menu additions give me reasons enough to go back to this once oft-visited restaurant? For sure. Those who thought Geoffrey's had given up, watch out - their game isn't over yet!